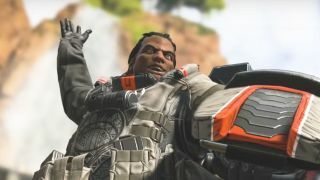 If you’re one of the many, many people who have been playing Apex Legends, then I have some good news: a new weapon could be heading your way very soon. On a Reddit thread started by Respawn itself, DotSports spotted an image of Mirage with what looks to be a weapon not yet available in the game itself, although some are highlighting that it’s difficult to tell from the picture alone as to whether it’s actually something new or not. From the looks of it, the gun is either an SMG or an assault rifle, but if you look at the full list of Titanfall’s weapons (which is where almost all of Apex Legends’ weapons come from) it doesn’t resemble anything that’s been seen before. Just look below to see it for yourself. Our own Apex Legends fiend Ford James thinks the weapon looks most like the C.A.R. SMG, but with a different paint job. Regardless, as there’s only been one new weapon added to Apex Legends since the game came crashing onto the scene, it’s about time our heroes got a new gun to play (and shoot) with, especially as Apex Legends Octane has already been added a new character since the start of season 1. Respawn itself didn’t mention any weapon additions in the Reddit thread, but considering the Apex Legends battle pass was announced fairly recently, it’s likely that the developers are building up to some new incentives to play, and a couple of new weapons might very well be one of them. In other words, watch this space. If you’re an Apex Legends fan here’s some Apex Legends tips, or look below to see them in action!